Homecoming Weekend at Samford University is filled with many activities for alumni and current students. There are the traditional tailgate, open houses and a rather newer event called the Alumni Showcase. This year’s homecoming is Nov. 9-12. 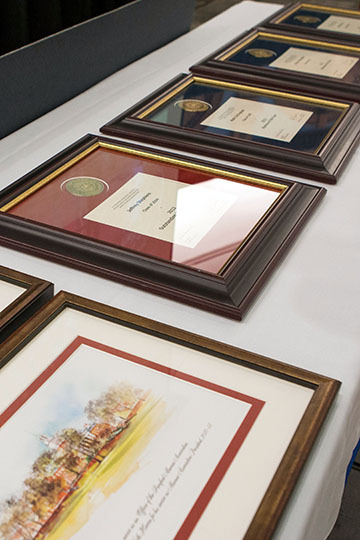 One alumnus is chosen from each school who has achieved significant personal, professional or community accomplishments. He or she will give a lecture and have a question and answer session. These lectures will take place on Thursday, Nov. 9. From the Brock School of Business Chad Trull ’05 will speak on creation, purpose, growth and future of Hospice Links and how his Samford education contributed to his professional success. Trull is president of HospiceLink Inc. in Birmingham. This will be held in Room 200 in Brock School of Business from 10-11 a.m.
From Howard College of Arts and Sciences, J. Alan Long ’95 will speak on his time at Samford to medical school to creating and leading a successful business in Birmingham. This lecture will be held from 1:30-2:30 p.m. in Davis Library, Room 234. Devyn Keith ’12 from Orlean Beeson School of Education will give a lecture held in Orlean Beeson School of Education, Room 118 from 9-10 a.m. Keith recently was elected to the Huntsville (Alabama) City Council. From Ida Moffett School of Nursing, Martha Ann Eisenberg ’59 of Montevallo, Alabama, will lecture on providing compassionate care for persons with opiate dependence. The lecture will be held in College of Health Sciences (CHS) Building 1, Room 1116, from 9:30-10:30 a.m.
Sheri Boston ’87 from the McWhorter School of Pharmacy will give her lecture on being brave in CHS Building 1, room 1222 from 10-11 a.m. Boston was president of Southern Pharmaceutical Services, Inc., in Birmingham. From the School of Public Health, Kristie Crowe-White ’00 will lecture on acquiring nutrition knowledge beyond textbooks. This will be held in Room 1118, CHS Building 1 from 10-11 a.m. White is a food scientist with Southern Progress Corp.
From the School of the Arts, Rob McClurkan ’94 will be holding an exhibit in the Samford Art Gallery. The exhibit is titled, “The Art of Illusion: An Exhibition by Rob McClurkan.” He will be showcasing his work in book illustration. The exhibit began Oct. 16 and runs through Nov. 11. There will be an artist reception Nov. 9 at 4 p.m.